Just like the appearance of more and more green leaves on a tree signals the transition from winter to spring, so does the occurrence of individual stocks breaking out of their respective secular bear markets and hitting new all-time highs signal the macro secular bear market that began in 2000 is coming to an end and a new secular bull market is in the process of forming. It is this fact that I argue that investors should begin to switch from a secular BEAR market investing philosophy to a secular BULL market investing philosophy. I argued the timeline for when we would reach new all-time highs in the U.S. stock markets was 2014-2015, but certain developments have occurred that suggest that new highs may occur this year or next, which are outlined below. The ratio of high income to lower income working age groups correlates to major bottoms and tops in the market as shown below. The peak in 2000 in the 35-49 age cohorts relative to the 20-34 groups correlated with the technology bubble and a low is projected to occur between 2014-2015. From there we get a small demographic boost in the age cohorts with the next peak expected to occur in 2028. The demographic bump in relative cohorts is not expected to be as large as what occurred from the 1940 to 1961 boom or as dramatic as the 1981 to 2000 surge, but the fact that it won’t be a headwind is a major improvement from the tailwind it has been since the 2000 top. Part of the reason why stocks tend to do well with rising demographic shifts is the tendency for valuations to rise as sentiment for stocks improves. Based on the rising demographic trend that starts next year through 2028 we are likely to see a rising trend in the S&P 500’s price-to-earnings (PE) ratio. A rising PE ratio coupled with a slow rise in earnings-per-share should lead to strong gains in stocks over the coming decade. One of the reasons why we have secular cycles is due to the time-tested principle that people don’t change. The two greatest emotions that every investor has battled with are fear and greed. We see euphoria and rampant greed at secular bull market tops and outright despair and fear at secular bear market bottoms. I highlighted this last year with the following two charts which show books and magazine covers at major secular turning points. Not only are individuals susceptible to fear and greed but also institutions. Pension funds, insurance companies, and endowments often reach extremes in their allocations at the worst possible time and are a source of funds to help move markets in the other direction. For example, many institutions had record stock exposures at the 2000 bubble peak with a low exposure to bonds. 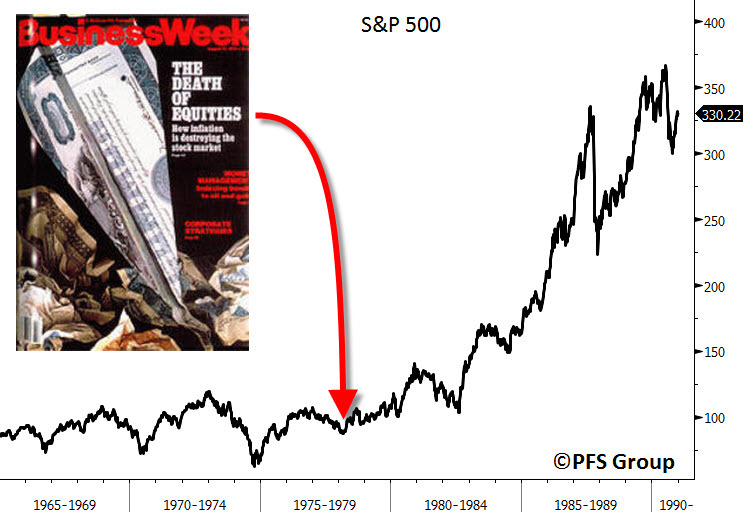 Since then we have come full circle where many are now proclaiming the death of equities. 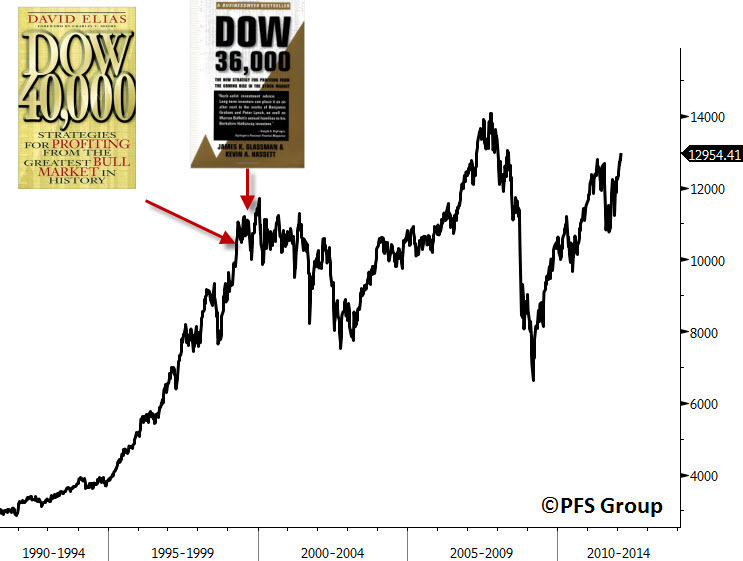 Was that not the BusinessWeek magazine cover just a few years before the greatest secular bull market in history? It is a once in a generation moment. For the first time in more than 50 years UK pension funds are holding more bonds than equities. Some fund managers have called it the death of the "cult of equity" and say it is part of the most significant market allocation trend since the 1950s. The shift to bonds has huge implications for the performance of pension funds and those that manage money for them. The trend is not limited to the UK. In the US, Europe and Asia, some of the biggest pension funds and asset allocators have been switching into fixed income. For example, Allianz, the world's second biggest manager of money with about 1.7 trillion euros under management, has only 6 percent of its insurance portfolio in equities while 91 percent are in bonds. A decade ago, 20 percent was in equities. Retail investors’ conservatism has also driven money out of collective investment funds. In the US, inflows to bond funds have exceeded equity inflows every year since 2007, with outright net redemptions from equity funds in each of the past five years. It's this juncture that has some of the most persistent global equity bears of the past two decades, such as Societe Generale strategist Albert Edwards, rethinking the big picture. While there's little thaw evident in his view of an investment 'Ice Age' over the next couple of years, Edwards now reckons that over 10 years long-term institutional funds are in danger of missing "the cheapest equity prices in a generation..."
It seems incredible by today's standards but by the early 1990s, British pension funds had almost doubled their allocation to equity over the prior 20 years to a staggering 80 percent of portfolios. So much so that at 43 percent in 2012, UK pension funds' holdings of bonds exceeded that of equities for the first time in almost 40 years. The precise numbers may differ, but this broad trend played out similarly across the globe. Japan’s public pension fund, the world’s largest, will start investing in emerging market stocks as early as this quarter as it seeks to diversify assets and cover rising payouts. The Government Pension Investment Fund, which oversees 108 trillion yen ($1.3 trillion), has decided on the managers who will handle the investments and is now in the process of setting up accounts in prospective markets, said Takahiro Mitani, president of the fund, known as GPIF. German mutual Alte Leipziger/Hallesche has increased the equities component in its €16bn ($20.15bn) investment portfolio to 5% from zero at the beginning of the year, and has plans to double that to 10%, despite Solvency II imposing a capital charge on such investments, writes Friederike Krieger, Oberursel, and Herbert Fromme, Bonn. Alte Leipziger is also seeking more investments in real estate. According to the Solvency II regime, insurers have to underpin investments in shares with 40% of their own capital, while there is no capital charge for government bonds. Botermann said Alte Leipziger can afford a higher percentage of equities in its portfolio, even after Solvency II had been introduced. “We cannot guarantee stable high returns if we invest only in fixed-income paper,” he added. “The shift of that massive amount of cash is what will be a game changer,” said Dalio, whose Westport, Connecticut-based firm oversaw $81.3 billion in hedge-fund assets as of Oct. 31. Last month brought about many news-grabbing headlines of all-time new highs, a characteristic seen in secular bull markets, not bear markets. The Russell 2000 small cap index hit an all-time new high last month as did the S&P 400 midcap index. The Down Jones Industrial Average exceeded 14,000 for the first time since the October 2007 top and now lies just 200 points away from an all-time new high. While the above indexes have been making headlines, one breakout that has not received as much attention as warranted is the breakout in the stock to bond ratio. The ratio of the S&P 500 Total Return Index relative to the Merrill Lynch 10-Yr Treasury Total Return Index broke out last month from a bearish trend that has been in place since the secular bear market in stocks began in 2000. This suggests that the long-term outperformance of bonds over stocks may be over with stocks providing higher long-run returns over bonds. 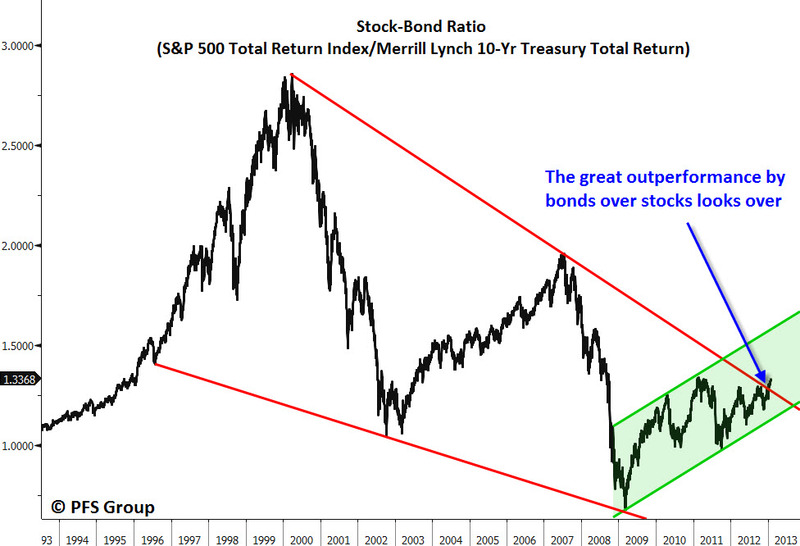 The outperformance of stocks over bonds is likely to continue for more than a decade as we hit a major extreme in long-term relative performance at the March 2009 lows. At the time the 10-year relative return spread between the S&P 500 Total Return Index and the Barclays Long Term Treasury Bond Total Return Fund reached levels not seen since the Great Depression. 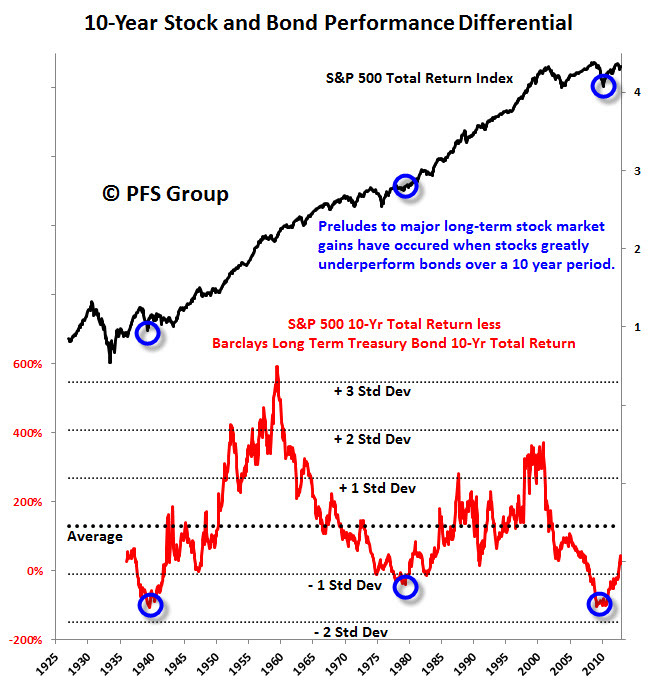 This is highlighted below in the bottom panel with the blue circles highlighting major secular turning points in asset class performance between stocks and bonds. As seen below, we have seen three occasions when stocks underperform bonds over a 10-yr horizon to a significant degree and after reaching these levels the stock market has embarked on long secular bull markets as occurred after World War II in the 1940s or the great secular bull market that ran from 1982-2000. Given how low interest rates are, it’s not hard to imagine that bond returns may be seriously found wanting relative to stock returns in the decade to come. Another way of looking at secular cycles is the 10-year smoothed average of the S&P 500’s annual returns. At the March 2009 low we reached an oversold condition not seen since the early 1920s, which was followed by the “Roaring 20s” that preceded the Great Depression. 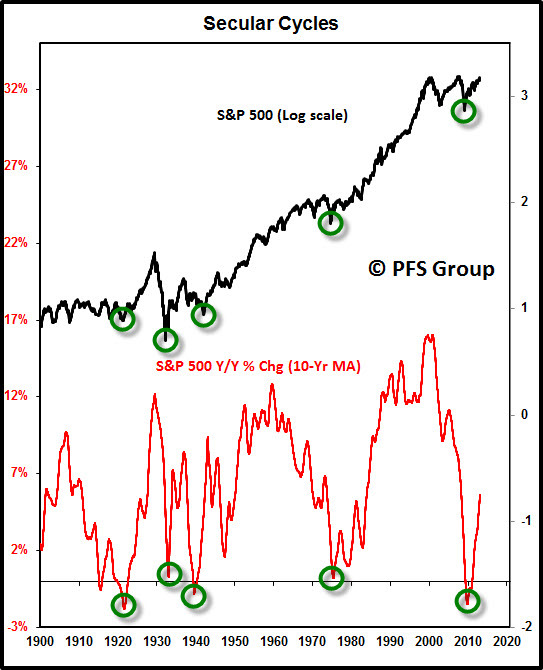 Moves near or into negative territory have also marked major bottoms in the stock market over the last century, providing more support that the March 2009 low marked the secular bottom in stocks. Looking at just secular cycles in the stock market shows a certain historical rhythm. 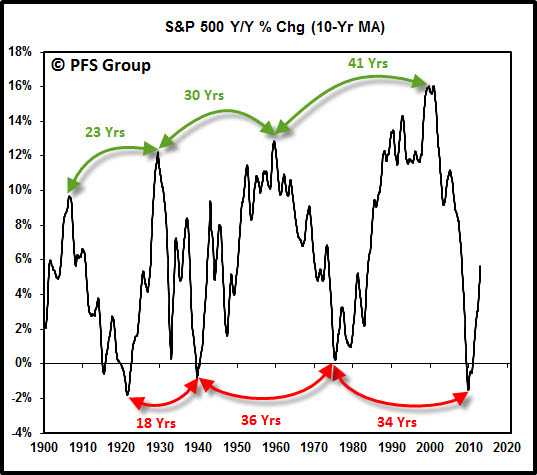 When taking a 10-year moving average for the S&P 500’s year-over-year returns, we see that there were 36 years separating the early 1940's low from the middle 1970's low. There were 34 years that separated the 2009 low from the middle 1970s which supports the notion that March 2009 was likely THE secular bear market low in stocks. The shortest period between secular bull market peaks was 23 years while the longest was 41 with the average of the last three lasting 31 years. Given those time frames and starting from the last secular bear market peak in 2000, the secular bull market may run until 2031, which is interesting as 2031 is close to the demographic peak highlighted above that occurs in 2028. With the small cap and midcap indexes reaching all-time highs and the Dow Jones Industrial average less than 200 points away from an all-time high, the case for a new secular bull market in stocks being underway is hard to dismiss. As suggested in articles I penned in 2011, there are likely two large forces at work that will propel stocks higher in the coming decade, one of which is favorable demographics out to 2028, and the other is the slow glacial movement of institutions rotating out of bonds and into stocks. With the benefit of hindsight, looking back at historical cycles suggests that the March 2009 low was not only a bear market low for the 2007-2009 bear market, but THE low for the secular bear market that began in 2000 with the technology bubble. 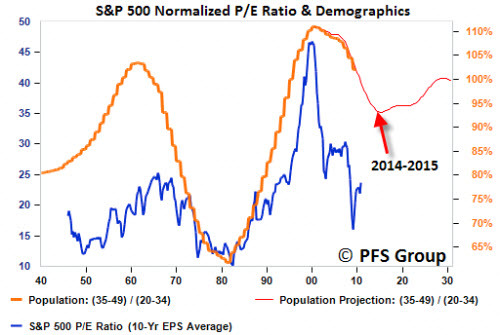 Looking at demographic trends and prior secular cycles, the new secular bull market in stocks could continue well into the 2020s.